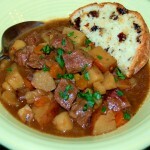 "Enjoy our rich and hearty, slow cooked stew, with our Irish soda bread. The perfect meal to celebrate Saint Paddy's Day!!" Pat the beef dry with paper towels. Season with a generous sprinkle of kosher salt and freshly ground pepper. Heat 2 tablespoons of canola oil in a large, heavy skillet over medium-high heat. Cook the beef in batches, until browned on all sides, about 8 minutes total. Transfer to a slow cooker. Continue until all the beef is browned and add more oil to the skillet, if necessary. Add the remaining tablespoon of oil to the same skillet and stir in the onions. Cook until softened and beginning to brown, about 5 minutes. Add in the chicken broth, 1 1/2 cups Guinness, light brown sugar, thyme, chocolate, and bay leaves. Bring to a boil and using a wooden spoon, scrape up any brown bits from the bottom of the skillet. Transfer to the slow cooker. Add the carrots, parsnips and potatoes to the slow cooker. Cook on LOW heat for 9 to 10 hours, or on HIGH for 6 to 7 hours. 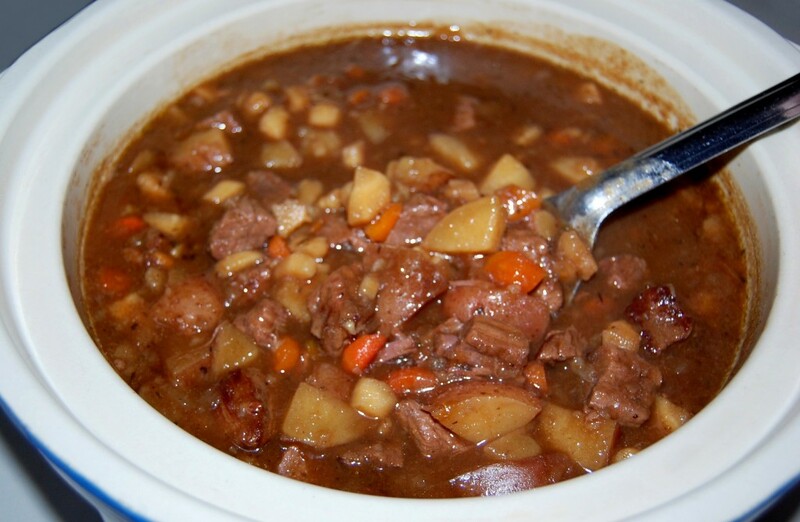 At the end of the cooking time, turn the slow cooker up to high. Whisk the flour and remaining 1/4 cup of Guinness together until smooth. Then stir the mixture into the stew. Cover and cook for an additional 15 minutes, or until the sauce thickens. Discard the bay leaves. Stir in chopped parsley and season with salt and pepper.